Interior wood trim is an attractive design element … and it’s not just for Craftsman and Victorian houses. Other styles of homes can also benefit from quality trim work. Many design programs feature the addition of crown molding and similar types of decorative wood trim to jazz up a home's interior spaces. Chair rails break up the plain appearance of large walls and define specific areas. Baseboards provide a finishing touch and conceal imperfections in the wall, floor, or the intersection of the two. Hardwood moldings resist denting and damage better than softwood varieties. Use hardwood in high-traffic areas or where chairs and toys will bang into them, such as baseboards and chair rails. 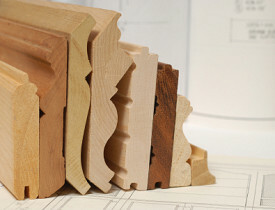 Here are 6 woods to consider when adding trim or molding to the interior of your home. Mahogany is imported and is considered a luxury wood due to its beautiful deep reddish-brown color (not to mention its high price tag!). Because it is a very hard wood, cutting and sawing can be difficult. Carbide tooling is generally required to make clean cuts. Use a grain filler before applying finishes to mahogany wood trim. Cherry wood possesses a slight pinkish tint and a characteristic swirl pattern. With age and exposure to light, the wood naturally becomes a deeper, richer red. Cherry is a hardwood that will readily absorb stain. It is smooth-textured and fine-grained. Soft maple can be stained to resemble other types of wood, like mahogany or cherry. Its natural pale color will usually have darker spots and squiggles, such as the desirable bird’s eye maple pattern. Soft maples like red maple and silver maple are popular choices for budget-minded homeowners who want the look of a finer wood. Due to its strength and durability, maple is easy to maintain with occasional cleaning. White oak is generally more expensive than red oak. White oak is weather-resistant and a good choice for both exterior trim and interior woodwork. If budget is an issue, save money while still achieving the look of oak for your interior trim by considering red oak. Both types of oak are easy to work with and to stain. Red oak reveals the distinctive oak pattern and is durable enough for any interior trim application. Usually about 10 percent cheaper than white oak, it is an excellent choice for homeowners on a budget who have an eye for oak trim. Poplar tends to be an inexpensive wood choice for the homeowner on a tight budget who still wants an earthy look for his home. Not suited for light color stain due to its often uneven coloration, poplar is an excellent, affordable option for painted trim or dark stain applications. For DIY installation of interior wood accents, the tools and supplies that you’ll need include a tape measure, chop saw, adhesive, and nail gun or hammer and nails. Prefer to let an experienced professional take care of the project for you? Hire a reliable carpenter. This article was updated November 9, 2017.